This week, just like the week before, is only a blur. Too much crammed into just seven days. This week's summary is also late because we chose to kayak, dive, and then snorkel/kayak when we should have been working on our summary. Either way, no regrets and Better Late Than Never. August 14th, 2004, turned out to be a wonderful day. We'd dived Kuamo'o and resighted the female with the white numerals "327" on her shell. This time we managed to get both her left and right profiles. That means she can now be a "counted" turtle. Seeing her twice in the same place also suggests that Kuamo'o is indeed her place of residence. 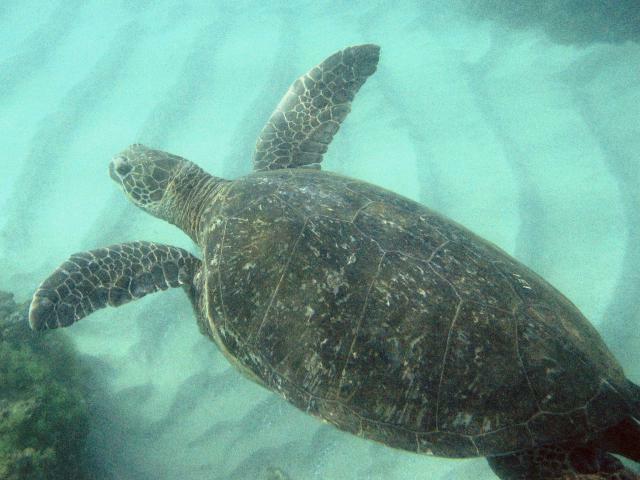 It turns out that August 14th delivered another returning female to the West Maui coast. Later that afternoon, we kayaked to our ohana's foraging site. Ursula did the snorkeling that day, and came upon a large female with the fresh white numbers, "27..." Now, was the last digit an "8" or a "9"? Ursula's notoriously poor eyesight couldn't determine for sure. She quickly snapped a picture of the turtle and hoped the photograph could cough up the last digit. Alas, at home, the computer revealed smudges where white numbers should appear. Depression! 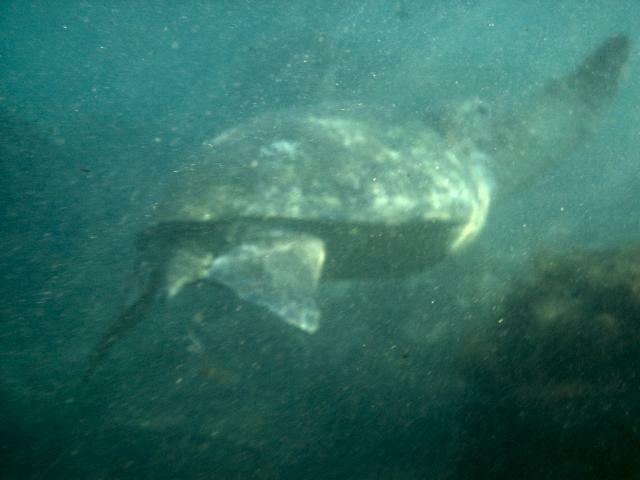 The first attempt to photograph this turtle's number was blurry--just like the whole week. So who was Turtle "27-something"? It took Ursula a frustrating two days to remember an email sent to her by George Balazs about our 2004 nesting females. She recalled he'd provided who had successfully nested and their mototool numbers! When she pulled up George's email, there was her answer. 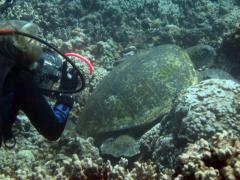 We'd been diving Kuamo'o to take advantage of the good conditions there. Tutu's return made us eager to get back out to Reef 2, so the next day, that's exactly where we headed. Sure enough, resting in exactly the same spot she always uses, there was our Grand Dame, bright new number 278 and all. Resting in exactly the same spot she always uses, there was our Grand Dame, bright new number 278 and all. Whenever one of our mother turtles makes a migration, we worry. We particularly worry about Tutu, because to us, she represents all the females of Honokowai. We weren't sure we'd get to see her before the summer was over, but luck was with us. She's back and unharmed. We're relieved and happy. On August 21st, during our late afternoon snorkel at our honu's foraging site, Ursula spotted two turtles jostling and fussing. It looked like a male trying to mount a female, only far more playful. As the female turned, Ursula could see a white mototool marking on her shell. Unlike her experience with Tutu, Ursula clearly read the number "131." She quickly took several photos. (Reading numbers isn't enough, it must be confirmed by photo or video, especially with her dismal eyesight). As the turtle turned again, Ursula saw the turtle's face. Talk about a surprise! It was a very good friend that we've known since 1992. Raphael had nested! Raphael, who we've known since she was an adolescent. We watched her grow up and now she's returned with "131." Raphael at the foraging site. You can make out her brand new "131" on the right side of her carapace. We've reported this to George Balazs and hope he can clear up why we didn't see "Raph" in 1997 and 2001. It's possible she nested in those years but didn't return in time for us to see a mototool. Maybe she didn't get a mototool number for some reason. Or perhaps she nested somewhere other than East Island. We don't know. She'll have a PIT tag, though, and there'll be records on her. We're certain George can provide an answer. Speaking of nesting, last week we reported on the emergence of 5690's Nest 4. On Sunday of this week, Skippy Hau excavated the nest and rescued five hatchlings that otherwise would've suffocated in the sand. 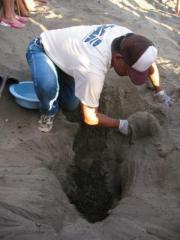 Skippy Hau excavated 5690's nest 4 and rescued five hatchlings that otherwise would've suffocated in the sand. Our favourite part came when the excavation was done, and Skippy had finished separating and counting the eggs and shells. Then he scooped large handfuls of sand to fill in the large hole he'd dug. As he was pushing the sand into the hole, his sharp eye caught a tiny movement. He'd unearthed a stray hatchling--a final rescue! One lucky tiny turtle. Yes, it might be Survival of the Fittest, but this little dude proved that Survival of the Lucky is just as good! As always, Skippy waited for sunset before releasing the youngsters. 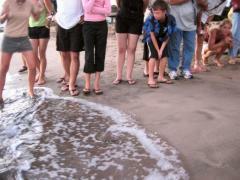 They tippy-toed down the beach past an appreciative group of well-wishers. Their odds of reaching adulthood aren't that good, but Skippy sure improved them Sunday evening. 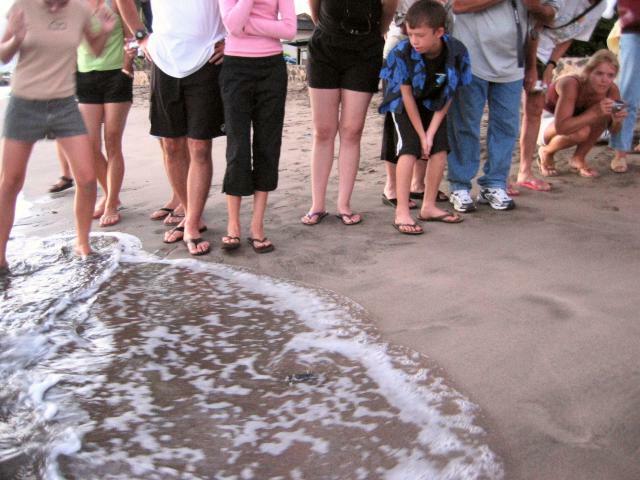 Onlookers wish aloha to one of Skippy's rescued hatchlings. After the excavation, we went home and stocked up for a vigil. We then returned to Lahaina in anticipation of 5690 returning to make Nest 8. This would be a new record for her. This would also mean we'd have a series of late nights. What with a mere sliver for a moon it also meant the beach would be Dark. Ursula doesn't like Dark. Dark feels scary. The first night, we kayaked to patrol the beach searching for 5690 in a north/south beach sweep. This helped us avoid walking the beach where axe-wielders, chain-saw rapists, serial killers, lions, tigers, and bears abound. Our strategy was as simple as it was elegant: bring a blanket and two towels for pillows and just stay right where we'd expect 5690 to crawl out. At midnight, if she failed to show, only then would we walk the southern section of beach. After all, if she nested anywhere along the beach, we knew she wouldn't finish that early. 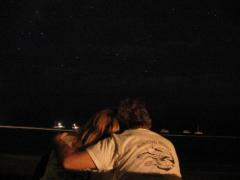 Soon we began to look at these beach nights as Quality Time Together. 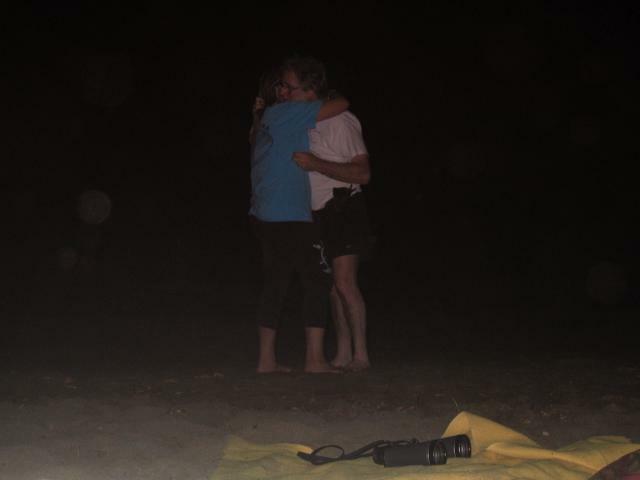 So we hugged a lot. Two people in love contemplate Maui's Fishook, or as it is known outside Hawaii, Scorpio. 5690 never showed. It meant three late nights--close to 1 AM before we got to bed. Like maniacs, we were still keeping up our normal day routines of kayak, dive, snorkel/kayak. Yes, married 17 years and never danced before. Well, between us we have four left feet, so, self-protection. We need those feet for diving. The last night reminded us of The Return of the Dead. Because we felt like it. We rolled out the blanket, placed towels for pillows, and within minutes, Peter was snoring away. This left Ursula to scan the beach to make sure 5690 wouldn't scoot by her (if indeed nesting turtles could scoot...). Ursula can't remember when she too fell asleep but sleep she did. Well, at least we were there in body if not spirit! We woke up sometime before midnight, did a final check to the south, and called it quits on 5690's 2004 nesting season. The Lady wasn't going for the Big Eight. Either way no big deal. The four very late nights in a row made us appreciate sleeping in a real bed and being in that bed before 9! Still no sighting yet. He's got one week and a bit. We have severe finger cramping from keeping them crossed.